This is a bit of a difficult book to review, I got through it very quickly but I am still unsure of my true feelings about what happened. I found at times I was losing interest in the characters and I just found that despite this being a quick read it was easy to lose my place and forget what had happened earlier on. The thing that had caught my attention was that Diana was bringing back to life characters from George Eliot's Daniel Deroda, and it was what made me want to read this book, but I think I need to know a bit more about that novel to really like this story. 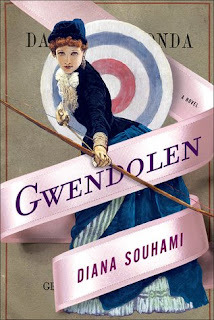 Gwendolen was a character that I just could not connect with at all and I just did not like, I just felt that the way she was portrayed was not in the best light at all. Even though Gwendolen has fallen in love with someone else she marries a rich man to help keep her family afloat, that one thing is what is good about Gwendolen. Throughout the story she seems to look back on her mistakes and you see many of her regrets. The worst part of the story to get through was the interactions between Gwendolen and her husband Grandcourt. Grandcourt has so many secrets that are hidden until Gwendolen actually arrives into the house and she learns that not everything is as it seems. Grandcourt seems to be sweet as he is courting Gwendolen and then learns that it is an act to get what he wants and from there he becomes a tyrant and Gwendolen is scared to be in her own home. Everything about how Grandcourt treated her was hard to read about, and it actually made me want to stop reading. Most of the novel is Gwendolen writing to Daniel and telling her about these brutal years of her life. She does grow a bit over the course of the novel and learns how to take care of herself and not have to be dependent on others, that was one thing that I did enjoy... by the end of the novel Gwen had taken it upon herself to get out of a disaster of a marriage. This book sadly did not end up being one for me and it is one I sadly can't recommend to people, it just was not a book that catches attention easily.